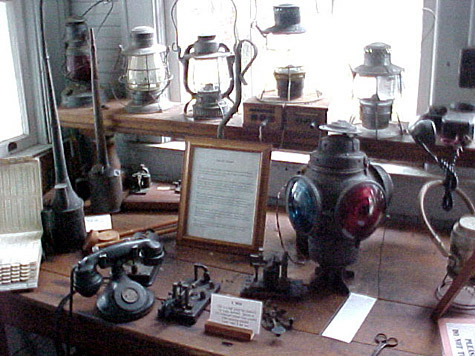 INSIDE THE TRILBY DEPOT: The telegraph was used to communicate between the stations, as there were no telephones in the early days of railroading. The gray cabinet is a test board, used to test the wires between stations. The stool is from the Zephyrhills railroad station. The wooden loop was used to pass messages to trainmen as the train slowed to pass through a station without stopping. Kerosene lanterns were used at night as signals, and to check the tracks for safety, in the days before battery-powered flashlights. Hanging from the hook is the first Red Comet fire extinguisher. Cone-shaped fire buckets were used as they were less enticing to thieves, since they could not be set upright on a surface. 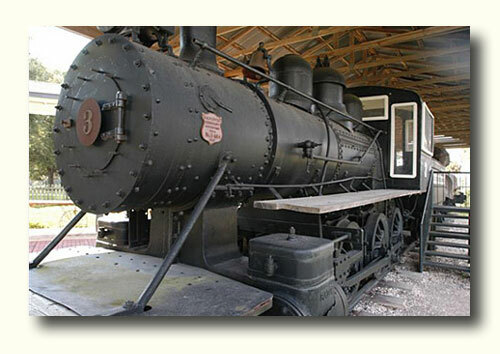 The 1913, 35-ton Porter steam engine was used for 50 years by Cummer Sons Cypress Company to haul logs out of the forests and swamps to their Lacoochee sawmill. From this sawmill, the cypress lumber and shingles were shipped across the country and around the world. The three logs displayed on the flatcar behind the engine and tender are cut from cypress trees estimated to be as much as a thousand years old. Train Depot artifacts are all about the building. 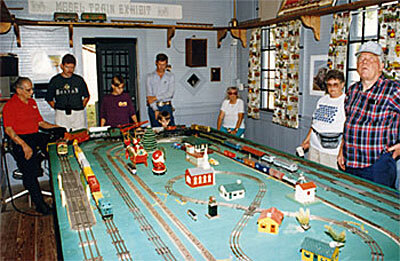 Model Trains are operated during local festivals. People used to set their clocks by the train? The railroad supplied 100-pound bags of phlox seed to be sown by the trainmen along the right-of-way? Phlox still bloom in many areas today as a result. The red bandannas often worn by trainmen around their necks were to keep cinders from the train's smokestack from falling inside their collars and burning them.